Who is Todd Ripplinger, and what is TNZ? Todd Ripplinger and Zack Percell met in October of 1990. Zack was 14 years old, and had been performing magic shows for a few years, and Todd was getting ready to do his first paying show at age 12. The two attended West Middle School in Rockford, IL together (Zack was in 8th grade, Todd in 7th) and met at school. They instantly became best friends, and almost instantly decided that they should start working together. Over the next year, Todd helped Zack at his performances and Zack helped Todd. During this time, they worked on an act that they put together, as a duo. They performed together for the 1st time at school within several months. It went over so well that they began to perform routines together at several solo shows. During their time performing together, Todd and Zack performed countless shows in the Rockford / Chicago area, and all throughout the mid-west. In 2001, TNZ had the honor of performing in Japan, where Todd lived for a year after College. He went to Columbia College Chicago, where he studied Video Production, and Japanese language. Around this time, the two decided to shorten the name of their act to: “TnZ Magic”. In February of 2003, Todd was hired to move to Maui and work as a video editor for a company started by a former college friend. Todd was excited because his girlfriend who lived in Japan really loved Hawaii, and wanted to live there. He decided that if Hawaii worked out, he would ask her to marry him, and they would live out there together. This would mean that Zack and Todd would no longer be able to perform together unless Zack also moved to Hawaii (Maui). This idea had been considered. Well, things had been going perfect for Todd, right away. He actually got offered job doing the same thing for a bigger company just months after being there. His talent could probably get him any job. He was hoping to eventually be offered a job with ILM, which would probably have easily happened, in time. Todd had a close friend on the Island that taught him how to surf. Surfing had become a new passion of his. He enjoyed surfing early in the morning everyday before going to work. He proposed to his girlfriend, Ikuko, on October 1, 2003. On November 21, 2003 Todd was starting to follow his usual routine of getting up early in the morning, driving about 30 minutes to the beach in Lahaina, Hi, and surfing for a while. He would go to work right after that. The last time anyone reported seeing Todd was before he went into the water that day. A kid found Todd’s Surfboard in the water near the beach he regularly surfed. Several days of searching by the Lahaina Fire Department divers lead nowhere. 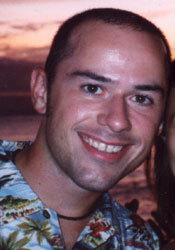 Todd Ripplinger, born May 4, 1978 has been missing and presumed drowned since November 21, 2003. If you were fortunate enough to have known Todd Ripplinger during his 25 years, you know just how much he is missed. He was an all around nice guy, a talented magician and the best friend you could ever hope to have!